It was 1979 when in Tetovo, the news about the establishment of a football club called ‘Shkendija’ (Spark), was heard everywhere. It would be a football club with an Albanian name, whose badge and shirt would have the colors of the national flag, the red and black colors. The idea for the establishment of the club derived from courageous intellectuals and sports fans of Tetovo as well as from the enthusiastic youth of this area. At this time period, such initiatives, characterized by a strong national sentiment, were quite difficult as the Yugoslav regime was not only discriminatory but also phobic towards everything that had Albanian national elements. The Albanian youth eagerly expected the establishment of this club, which would enable them to show and develop their skills in football and compete in the leagues of the country. Among the first initiators were Shinasi Karaxhenemi and Xhemaludin Abazi. Then they met with Mitat Eminin, who several years ago, since the early 1970s, had registered the Sports Association Shkëndija, part of which were several already established clubs such as the Volleyball Club Shkendija, the Club of Karate Shkëndija; these were now joined by the Football Club Shkëndija . Karaxhenemi and Abazi, together with Emin, as the chairman of the Association, soon expanded the circle of co-thinkers and formed a council that would deal with further activities. Their persistent efforts resulted successful as the club joined the Municipal Football League. 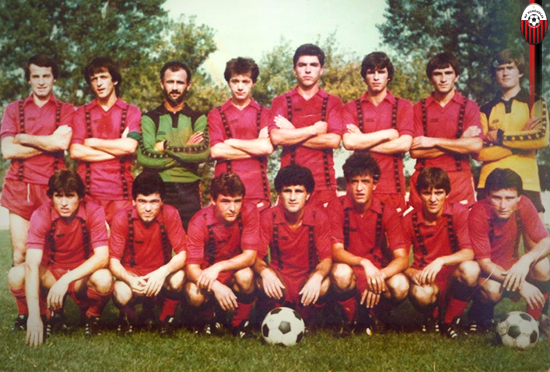 Thus, 1979 marked the start of the operation of FC Shkendija. 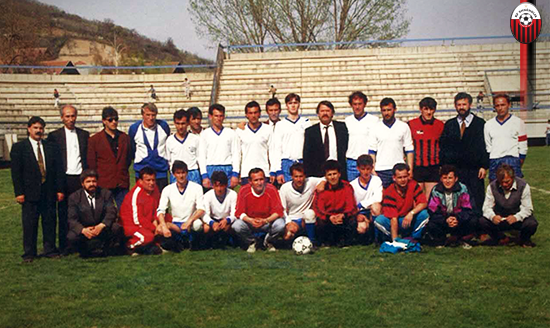 The first managers of the FC Shkëndija were: Ismailaki Kuriu (president), Ymer Reka (secretary), Shinasi Karaxhenemi, Mustafa Mustafai, Mahmudnedim Mahmudi, Xhelal Zoti dhe Hajredin Hajredini (senior member). The names of the players who made up the first generation of the FC Shkndija were: Genc Kuriu (captain), Nijazi Nuhiu (goalkeeper), Gajur Luma, Beqir Xhaferi, Rauf Ramadani, Naser Kuliku, Stojçe Ilievski (goalkeeper), Zarif Arifi, Iljaz Shahini, Pajazit Arifi, Shani Fetai, Afrim Jonuzi, Harun Ceka, Hebip Shaqiri, Menan Memeti, Zeni Arifi, Myrtezan Demiri, Besim Ibraimi, Qazim Halili (goalkeeper), while the first coach was Xhemaludin Abazi and assistant coach Abdyrezak Rustemi – Doda. The young tetovars had for years shown their talent and affinity not only in football but also in many other sports disciplines. 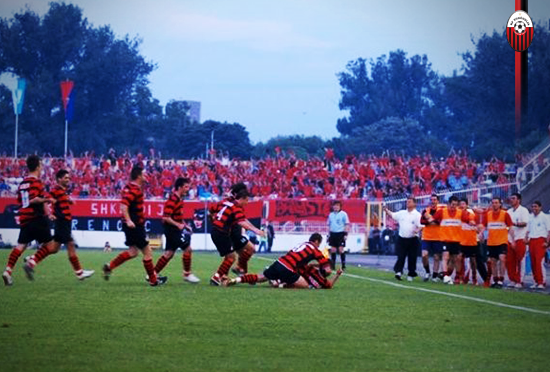 Since the first matches in the green field, the club of Shkendija shone with its beautiful game and its high scores. Within a short time, the club managed to create a team with high quality, compact, and ambitions for success. In the first official match in the Municipal League, FC Shkëndija plays with FC Kosmos from the village Podbredje, Tetovo. 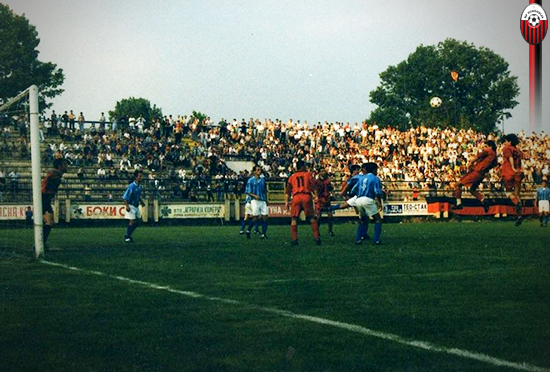 The match took place on the back-ground near the old city stadium in the presence of about 2,000 fans. This match ends with a 4: 0 score for Shkendija. Shani Fetai scored the first and second goal, Pajazit Arifi scored the third goal, and Namik Ramadani scored the fourth. This first and deep victory over Kosmos brough joy to many fans of Shkëndija and all of the sports fans of this region, while it gave further encouragement to the red-and-black team. 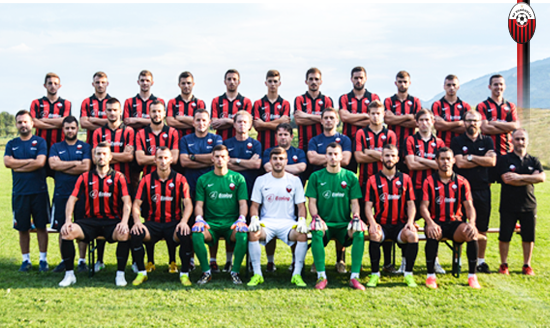 In the period when Shkendija was playing its first matches, it is worth mentioning the first friendly match that Shkendija played against the Gjakova team “Vellazerimi” (Brotherhood) in Gjakova. The match brought a lot of emotion and above all, it brought a very fraternal atmosphere and ended with a ‘fraternal’ result as well, 2: 2. At this time the club was in good financial condition. It was financed by the standingsmembers as well as by numerous businessmen and emigrants; the ticket sales also provided significant financial means. This made it possible for Shkëndija, after its establishment, to allocate 12 scholarships for the young football talents from the pooled financial means. For a very short time, the club developed rapidly. Besides the sports development and physical training, young people here received a healthy education in a national spirit. This would be soon noticed by the anti-Albanian government of the time, which, as it was feared, would break the dream of the Albanian youth by the ban on the exercise of activity which came in 1981 by the Yugoslav chauvinist regime. In socialist Yugoslavia, although “unity-fraternity” and equality between nations were proclaimed, the Albanians were treated as “second-class” citizens, being discriminated, persecuted and under constant systemic repression. In this context, the Football Club of Shkendija was perceived by the Yugoslav regime not only as a sports club, but also as a spark which would ignite and develop national sentiments in the Albanian youth. Shkendija’s wins in the green field and the multiplication of its fans from one match to another the game were a worrying reality for the government. 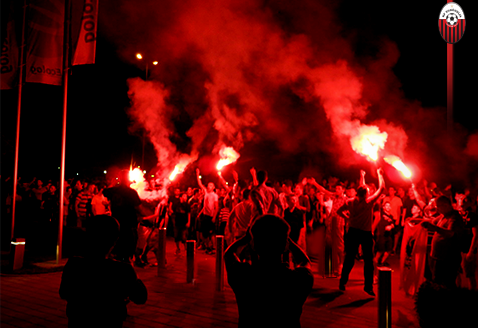 According to certain structures of the government, incidents were created, for which the blame would be addressed to Shkëndija, with the ultimate aim, the destruction of the club. 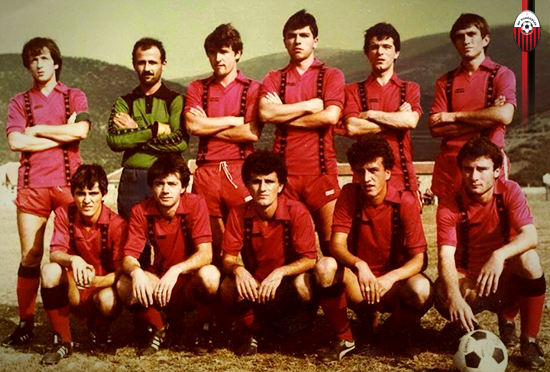 In the context of this campaign against the red-and-blacks, let’s recall the 1980 match when Shkëndija, as the leader in the standings chart played against the team ‘Çuka’ from Vollkovia (village in the Tetovo district, inhabited by Macedonians) for promotion of the club to republican level. The first part of this match that was taking place in Vollkovi ends with a goal scored by Shkendija. As soon as the second part of the match begins, a fury of the fans of ‘Çuka’ but also of their players emerges, the result of which, due to a fierce interruption, is a serious injury of the player of Shkëndija, Rauf Ramadani. In tense circumstances, the game is interrupted due to lack of conditions for the game, but in fact it was a tension instigated for the sole purpose of preventing Shkendija from moving to a higher level of competition. By all means, 1981 worsened the situation even more for Shkëndija. It was the year when massive demonstrations broke out in the Albanian areas under Yugoslavia where Albanians demanded rights and equality with other peoples of the Yugoslav federation. From the ’81st until Yugoslavia’s dissolution, certain power structures exerted a fierce institutional campaign against Albanians here. Under the accusation of nationalism and irredentism, many Albanians employed in schools, factories, hospitals and other state institutions were expelled from work. In the wake of this unprecedented anti-Albanian wrongdoing, many cultural-artistic associations and sports clubs were suspended, among which was the Football Club of Shkëndija. So, FC Shkendija took the ‘label’ of one of the nationalist camps where the young Albanians were educated in the national spirit, in the spirit of the red-and-black colors. The dissolution of Yugoslavia and the spirit of democracy that came across these sides brought Macedonia’s independence from the Yugoslav Federation. The changes that came to these areas created an opportunity for the reestablishment of Shkendija with an aim to walk towards the dreams of its founders, to walk towards the road of success and to restore the dignity of the sports fans who passionately attended Shkëndija’s matches. Thus, in 1992, the initiative council was convened by Miftar Ziberi and initially re-established the Volleyball Club and a week later the Football Club of Shkëndija. The assembly was held at Kabashi’s tea shop in Çarshi e Epërme (Upper Bazaar) in Tetovo where 12 members were present: Habil Bexheti, Ibrahim Kabashi, Irfan Xhelili, Rametulla Baftjari-Tushi, Latif Sejfullai, Kujtim Vela, Nexhbedin Sinani, Murat Ameti, Zeni Arifi, Nakil Abazi, Afrim Junuzi dhe Abdylrezak Rustemi. Nexhmedin Sinani is assigned the task of the coach, while his assistant became Ismail Sulejmani; coach of the goalkeepers became Kujtim Vela. During this period, the training sessions were carried out at the Sports Center. While in the first match of the Municipal League, Shkendija plays against FC Reçica, and as a result of the goal scored by Islam Ibrahim, wins with result 1: 0. 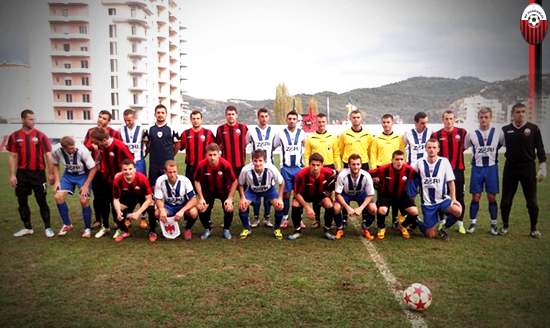 In this period Shkendija also plays a friendly match with FC Teuta from Durres. Shkendija wins this match with a score of 2: 0, with goals scored by Namik Ramadani and Gajur Sadiki. In the first year of the competition Shkëndija wins the championship title and ensures participation in Play-Off for its placement in the Third League. In the first semi-final match Shkendija wins against the Sllatina team, while in the second (final) and decisive match it suffers a loss by Saraqina with a score 3: 1. In the Play-Off, the team’s coach was Aqim Memeti and under his leadership the team managed to qualify for the Third League, from which point onwards the team’s successes would follow continuously. The good performances were also present in this category and at the end of the season the ‘red-and-black’ team marks the next success by joining in the Second League of Macedonia, the Group-West. One of the matches to be recorded in the history of the club is that against FC Fortuna of the Hasanbeg neighborhood, Skopje. 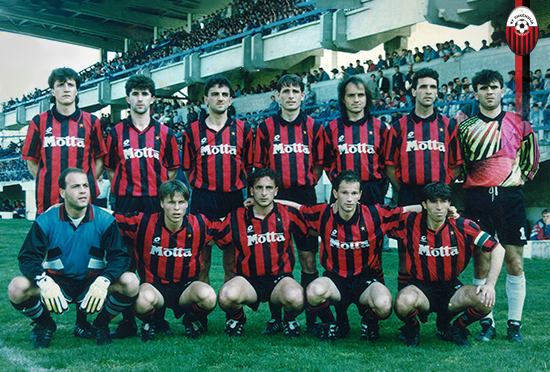 In this match played in 1994, Shkendija wins with a 5: 1 score and ensures its qualification in the Second League. Alongside the game and the good score, this match will be remembered for the record number of the fans present at the stadium. According to approximate estimates, the figure is about 17,000 and for comparison, on the same day in Skopje, Macedonia’s representative team played against the representative team of Ukraine, and only about 7,000 fans were present at the stadium. FC Shkëndija’s joining in the Second League brought to the club a higher level of organization and overall mobilization for the new challenges that would come. The level of competition itself in this League imposed such a thing, while in these circumstances, Shkendija performed in the best possible way. In this period, Shkendija makes a qualitative turn, bringing into the club a number of renowned players in our lands and beyond, as well as the well-known Kosovar coach Hysni Maxhuni. The staff and players’ caliber itself impelled an even more perfect organization within the management of the Club. Shkendija of such level demonstrated to all the sports fans in the country and beyond that the ambitions of the club were quite high and that the goal was to join the First League of Macedonia, where Shkendija objectively deserved to be. 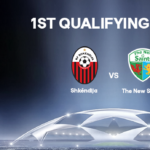 In the first season competition of the Second League, Shkendija could not reach the First League. The closing of the season stopped it in the third place in the standings but this did not discourage the team; rather it made the team more committed and determined. 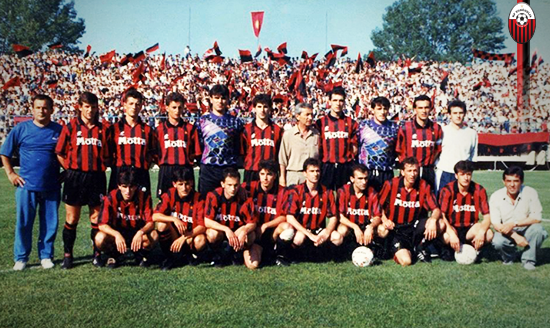 With the will and great commitment of all of the club structures, in the next season 1994/1995 Shkendija convincingly wins the first place in the Second League and with this success it ensures its historic promotion, its joining of the First League of the country. In this period, the president of the club was Abdylhadi Veseli, the team coach Ajet Shosholli from Kosovo, while the captain Ibrahim Osmani. In this season, when Shkendija wins the champion’s title in the Second League (Group-West), the top scorer of the team was Qatip Osmani, while among others, in remembrance remain matches against Teteks (win 2: 0 with goals scored by Qatip Osmani) and the match against Haraqina (win 1: 0), when the stadium was full of spectators. 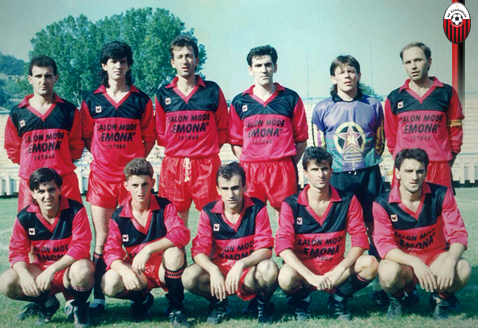 The first match of Shkëndija in the Macedonian football elite took place on August 18, 1996 at the Tetovo City Stadium against the Bellasica team from Strumica. Shkendija won this match with a 1: 0 score, with a goal scored in the 48th minute by Ixhet Jusufi, the first goal scorer of Shkendija in the First League. The next match against Bregallnica in Shtip, brought a defeat for Shkëndija with a score of 3: 0, while in the third round in Tetovo, Ibrahim Osmani and Skender Jonuzi scored for victory 2: 0 against Sasa team from Makedonska Kamenica. With this team of very good players Shkendija held its positive pace in the fourth round as well, thus beating Slloga Jugomagnat (now FC Skopje) with a score 2:0; goals were scored by Qatip Osmani and Skender Jonuzi. The October 15 match against Tikvesh in Shtip showed the first signals about scenarios against Shkendija. In this match, Shkendija was forced to lose 1: 0 due to an inexisting goal, a goal seen only by the referee. In reality, the ball passes by the gate, while the referees, claiming that the net was torn, affirm the goal as regular. This happened in the fifth round, while in the sixth, the first defeat would take place in Tetovo with 1: 4 score by the champion and the dominant team in the championship of that time, Sileks. On the seventh round, Shkendija remaining even without goals with Pelister in Bitola grabbed the first point from a match as a guest. The team continued with the positive performance, being a tough rival to beat in Tetovo and the end of the fall season found it in seventh position among the 16 competing teams. With the start of the spring season, Shkendija lost its first match with a score 3: 0 from Bellasica in Strumica, while the second round, when Shkëndija plays against Bregallnica in Tetovo, marked the start of the red-and-blacks’ fall. In this match, even the referees ‘play’ for Bregallnica, thus making Shkendija’s victory impossible. Being too provoked and outraged, some of the red-and-black players attack the referees physically. After this event, for Shkëndija would follow record punishments by the Disciplinary Commission at the Macedonian Football League. The punitive measures included the ten next matches to be held 100 km away from Tetovo as well as a two-year suspension for the coach Ajet Shosholli and the players Ibrahim Osmani, Skender Jonuzi, Muharem Dosti and Halim Hodai. While the fine for the club was about 100,000, oo DEM (German mark) on the FLM account. This situation would prove to be overwhelming for the club, and despite the resistance it made to the last round, Shkendija lost its status in the First League. The situation at the club became unbearable for the sponsor Abdylhadi Veseli as well, who withdrew from the club. The presidency was taken by Rexhep Bexheti, but he failed to avoid the worst. In the last round, Shkendija needed victory in order to secure its position in the league, and this was a match against Vardar in Struga. Unfortunately, the score was tied at 1:1, which resulted in Shkendija’s fall in the second category, only after a year of competition in the First League. After 2-3 years of oscillations in the second league, the end of the season 1999/2000 finds Shkendija at the top of the league’s standings and the team is again promoted to the country’s football elite. 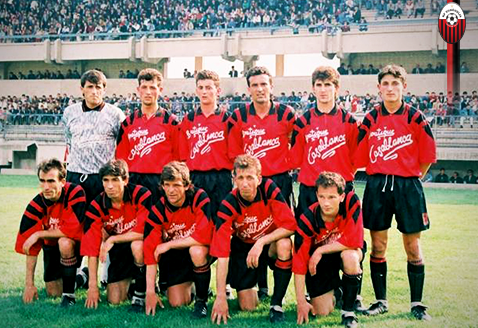 This time as well, both with its performance and results, Shkendija was advancing very well, but due to the 2001 conflict, things changed in this season. 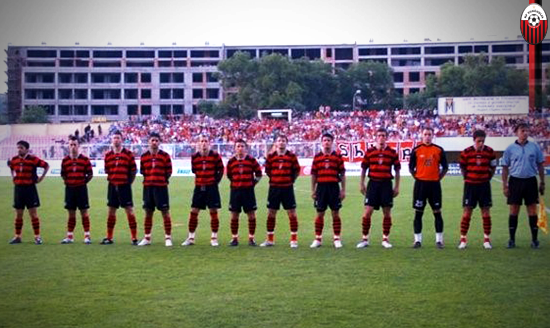 These circumstances, the armed conflict and the tense political situation caused Shkendija to remain out of the competition in the season 2001/2002. The season of 2002/2003 found the red-and-black team again in trouble. The Macedonian Football Federation demanded that Shkendija turn back to restart from the Municipal League but this demand was rejected thanks to UEFA’s reaction and thus Shkedija returned only to the Second League. 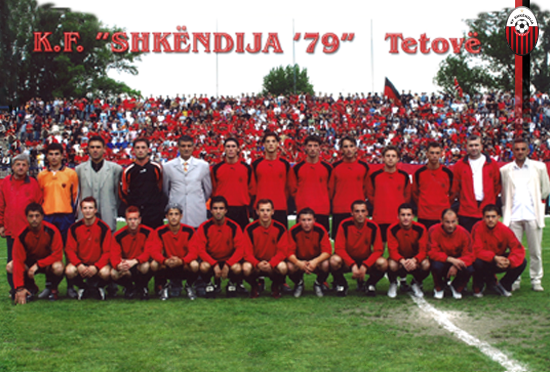 The club ends the season 2003/2004 as second on the standingsand this enables Shkendija to advance for the third time towards the First League where it stayed for two consecutive seasons. The gradual rise and success of the team made possible for the first time in the spring of 2006 Shkendija to qualify for the finals of the Macedonian Football Cup where it played against Makedonija Gj.P. Unfortunately for Shkendija, this match finished with a score of 3:2 for the opposing team. In the season 2006/2007, with a modest and healthy team, ensured its position in the First League and in the upcoming championship. Pas kësaj periudhe Shkëndija sërish u gjend në krizë të thellë financiare, u larguan disa nga futbollistët dhe si rrjedhojë erdhi rënia në Ligën e Dytë në v. 2008. After this period Shkendija again found itself in a deep financial crisis, some players left the club and consequently the latter fell in the Second League in 2008. After 30 years of struggling, left in the mercy of destiny, without finances and without sponsors, Shkendija will find again the support of the Tetovars who could not bear to see their favorite team remain alone. This time it was our emigrants those who rearranged and stabilized the team financially. Messi Group was the sponsoring company and under the leadership of our compatriots the team marked a turn towards successes never experienced before. 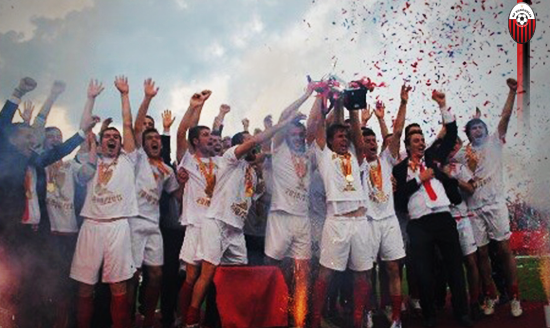 In the season 2008/2009, ranking third in the standings table, Shkendija could not manage to move to the First League but in the next season 2009/2010 it is convincingly proclaimed as a champion of the Second League and for the fourth time it is promoted to the First League. 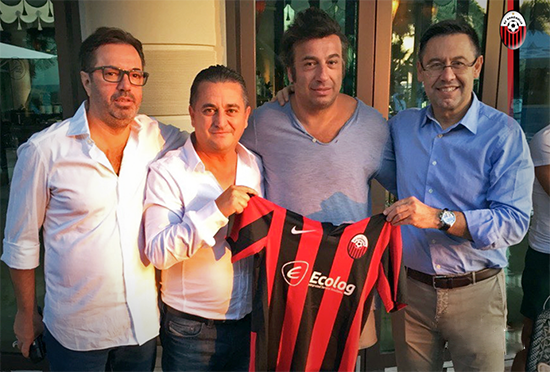 Thus, Shkendija emerged one more time as a club with an extraordinary power that left traces in the history of the club and football in Macedonia. 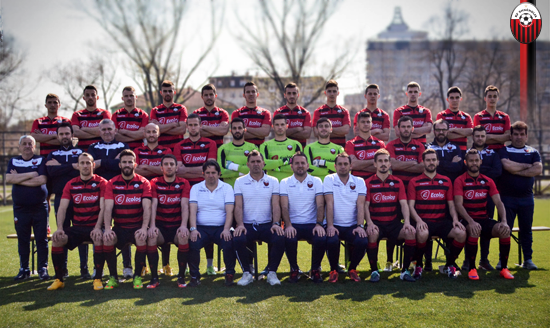 With an unprecedented strength until now, in this season Shkendija managed to win the Macedonian First League Championship, marking even 16 consecutive victories with no losses in the spring part. President of the club at this period was Nuriman Shaqiri, Chief of technical staff – Qatip Osmani, assistant coach – Erhan Selimi, goalkeeper coach – Enver Ramadani, team captain – Nebi Mustafi. While, the players of Shkendija’s generation who achieved this historical success were: Suat Zendeli, Adis Velii, Burim Guxhufi, Mexhit Neziri, Ilir Elmazovski, Xhelil Abdulla, Vladimir Nikitoviq, Sedat Berisha, Nebi Mustafi (c), Ardian Nuhiu, Ardian Cuculi, Izair Emini, Kemal Alomeroviq, Ferhan Hasani, Muhamed Useini, Ersen Sali, Valmir Nafiu, Marjan Mickov, Elmedin Rexhepi, Marian Bilbilovski, Bllagojce Gllavevski, Jasir Selmani dhe Nasir Azizi. 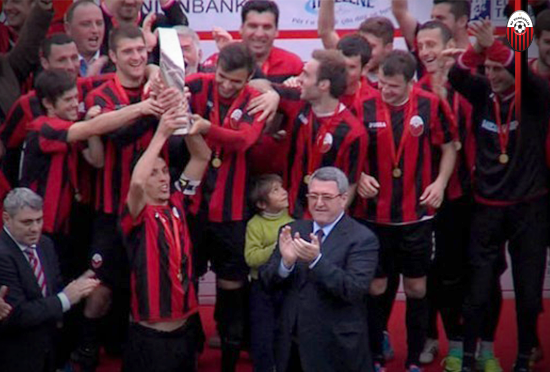 After being declared champion, Shkendija met other successes as well. Shkendija will also be remembered as the first winner of the Macedonian Super Cup trophy, since as the country’s champion it defeated the Cup winner, Metalurg, with a score of 2:1. This was the first edition of the Super Cup organized by the Football Federation of Macedonia. Nebi Mustafi by a penalty and Ersen Sali were the scorers of the goals which brought the Super Cup trophy to Shkendija. 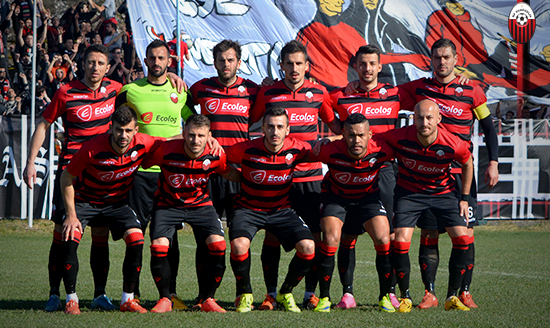 Winning the championship provided Shkendija with the first qualification in the European Cups. The debut happened in the Champions League qualifiers where the drawn lot had decided the red-and-blacks play against Partizan in Belgrade. The first match in Belgrade revealed a dignified Shkendija but considering that it played against a team with a tradition and long international experience, the match ended with a 4: 0 score for Partizan. At the return match in Skopje, Shkendija demonstrated again a high level of play but failed to win the match. This match closed with a goal scored by Partizan and with the overall score of 5: 0, thus eliminating the ‘red-and-blacks’. Despite the heavy financial situation in the season 2011/2012, for Shkendija things did not go bad. The end of the championship ranks Shkendija as third in the table. This position provides the opportunity for Shkendija to play in the European Cups, this time in the Europa League. Fortunately for Shkendija, the drawn lot decided it to play against a less better team, so against the semi-professional team from Northern Ireland, Portadown. This brought to the club the courage and hope to make a first round in Europe, as victory would be a remarkable achievement for Shkendija but also a financial impulse much needed for the club. Nevertheless, Shkendija unfortunately failed to win, as the first match against Portadown at the Kumanovo City Stadium was closed without goals, while the return game, which took place in Northern Ireland, ended in 2:1 for the home team. From the match with Portadown in Northern Ireland, worth to remember is that Shkendija recorded the first goal in Europe, scored by Ardian Cuculi. With this result Shkendija was eliminated from the competition and this elimination meant that the club was entering into an even deeper financial crisis. On the jubilee anniversary, on the 100th anniversary of Independence of Albania, the fourth edition of the traditional nationwide tournament, the ‘Independence’ Cup was held. This November of 2012 brings to Vlora many teams from all Albanian regions. After many matches which took place for two weeks between the teams, the last matches were between the four best teams, FC Flamurtari, FC Tirana, FC Prishtina and FC Shkëndija. Initially, Shkendija beat Tirana with a score of 1-0, ensuring its participation in the finals where they played against the team of Prishtina. The match against Prishtina ended in a draw without goals and crucial were the shoot-outs from the 11 meters white mark (penalty), which brought the trophy to Shkendija’s strategist Artim Shaqiri. In honor of the 100th anniversary of Independence, this tournament was specially and spectacularly organized. Captain Izair Emini was the first of Shkendija’s team to raise the cup high as soon as it was handed over to him by the head of the Albanian Football Federation, Armando Duka. Since the beginning of the championship, the financial crisis was being felt, but was the character, will and dedication of the team held the triumphant spirit high and played the matches enthusiastically, entering the green fields only to come out as winners. Despite numerous financial and other difficulties, the end of the championship ranked this team as sixth, while in the Cup competition Shkendija eliminated Vardar in the semifinals and became qualified for the final match with Teteks, also from Tetovo. 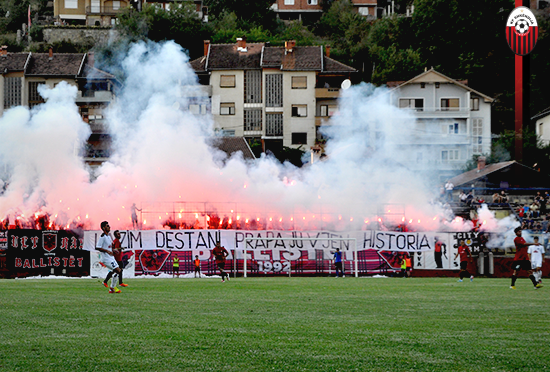 It was the 22nd of May 2013 when the two teams with traditional rivalry met each other in the Tetovo City Stadium. Surrounded by tribunes full of fans, both teams were looking forward to winning the Macedonian Cup. During the first part of the match, the referee interrupts the match in the 33rd minute due to insults on ethnic basis. FFM officials decide that the match should be terminated and the next day they decide the match to be held on May 26th in Skopje, but without the presence of fans in the stadium. After four days, Shkendija began this match with a good performance and as it was advancing with a 1:0 score, it suddenly remained without its goalkeeper Velii who was shown a red card. In the second half of the match, Teteks leveled the score and since the extra time did not change the score, the penalty shoot-outs from 11-meters distance made Teteks the winner with a score of 6:5. This misfortune was a heavy blow for Shkendija, saddening and pushing them to an almost destruction. Thus, hopeless about saving the club, players and members of the technical staff, despite their will, began to move to other clubs, where opportunity was granted. It was a very unpleasant situation that signaled a danger of a possible dissolution of Shkendija, and thus its remaining out of the championship in the following season. 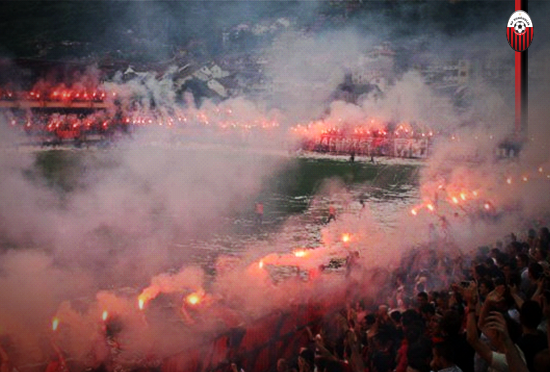 A wave of despair descended particularly over the many fans of Shkendija, and especially over the ‘Ballists’ grouping. Considering Shkendija was the team of their hearts, they did not quench all the hopes. They knew that in Tetovo there is a giant company of international size called ‘Ecolog’ and that Lazim Destani would not let Shkendija and the youth’s dignity to fall down. 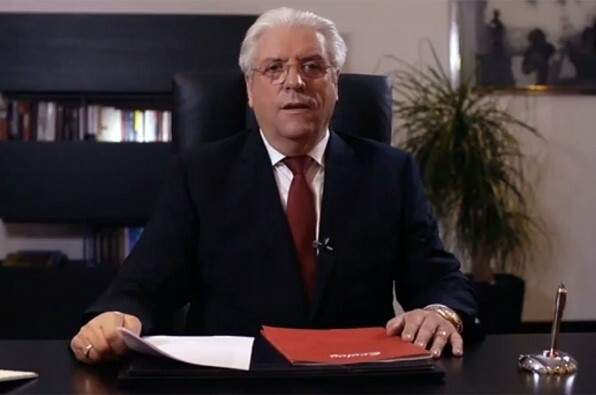 The fans asked Ecolog to help Shkendija for a fee of EUR 15,000 (the annual membership that clubs pay for at FFM), which was a condition for the club’s stay in the First League. This assistance was provided by Ecolog but nevertheless, the financial problem of the club had not yet been resolved. On the eve of the next season 2013/2014, the club had zero budget and a debt of about 100,000, oo EUR. Therefore, the Ballist group led by leader Shkëlzen Meta in co-operation with the management of the club headed by Albion Osmani, having no other way out, again turned to Lazim Destani, this time demanding from him to do much more for the FC Shkëndija. Thus, the Ballists without hesitation launched their campaign, “Ecolog, Say Yes!”, in which they asked from Ecolog to sponsor and manage the FC Shkëndija. The heat of those summer days did not stop the rallies and cheers of the ‘Ballists’ and the fans who gathered at the city square and accompanied by drums went all the way to the front of Ecolog’s building to cheer all together, “Ecolog, Say Yes! “. 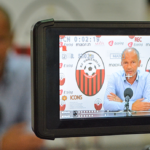 During their one-month campaign they sought from Lazim Destani sponsorship and the club’s management, two things that were already an imperative for the survival and development for Shkendija’s club. We are aware that Shkëndija is more than a sport club, it is part of our city’s culture, it is an integral part of our history and heritage, not only in the Polog region but in all our lands … Dear young people, you are our pride, precisely you and your future were the main motive to consider your claim so seriously. 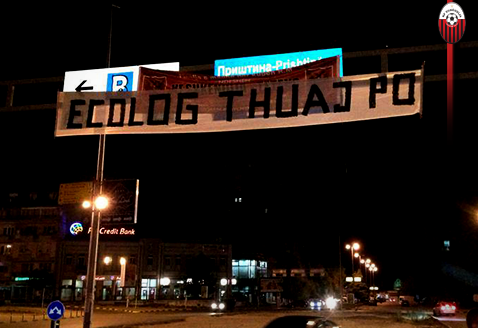 So, my answer is, ‘ECOLOG’ says, – YES, ‘SHKËNDIJA ‘. The positive response of Lazim Destani was awaited with great joy and celebration in Tetovo and beyond. Soon, the management team of the club was elected and the team was formed. The president became Jetmir Bexheti, sports director the swiss Mathias Valter, while the general manager Arber Shaqiri. The autumn part of this season was unsatisying as it brough unwanted results. After the winter preparations, the start of the spring season found Shkendija reinforced with quality players and with a professional technical staff run by coach Shpëtim Duro. Në këto kondita, me mbarimin e këtij sezoni, Shkëndija jo vetëm që arriti të mbetej në Ligën e Parë por edhe e siguroi kualifikimin për Kupat Europiane. In these conditions, at the end of this season, Shkendija not only managed to stay in the First League but also assured the qualification for European Cups. Shkendija ensured the participation to Europe at the end of the season, and this was a success that brought the team a modern, specially designed German bus for football clubs. It was the pleasure of Lazim Destani to make the team a surprise gift because as Shkendija deserved it by showing willingness and enthusiasm to move on the road to success. July 1, 2014 will be remembered for the first victory of Shkendija in a European Cup match. 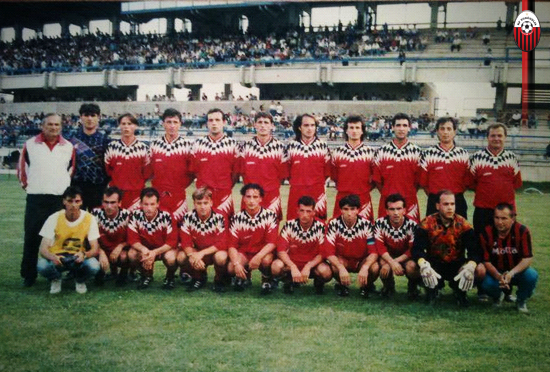 This match took place in Skopje where Shkendija won against the Moldovan team Zimbru with a 2:1 score, with goals scored by Bojan Vruçina and Ivan Mitrov. The return match in Chisinau did not bring to Shkendija the desired joy as the loss of 2: 0 eliminated it from the Europa League. Shkendija’s coach in this period was the Croat Roy Ferencina. Already with a quality team and a one-year management experience, Shkendija is entering the 2014/2015 competing season with ambitions for the championship title and the Macedonian Cup. Though at the beginning of the season it seemed that things would go best, things didn’t turn out this way. During this season, the club’s managers were forced to make some changes, which would then consume the time needed for consolidation. Lulzim Imeri was appointed chairman, Nebi Musatfi sports director, while Ardian Kozniku head of technical staff. After spending several months of struggling in the championships, things did not work well and this led to the replacement of the coach Kozniku. The role of the coach was entrusted to the current assistant coach, Jeton Beqiri. Under the direction of Beqiri, the team had a long series of victories and a well-organized game. In this period Shkendija beat Vardar twice, 3:2 in Kumanovo and 1: 0 in Kicevo. The end of the season 2014/2015 finds Shkendija in the third position on the standings chart, and this brings a new opportunity for game in Europe. The drawn lot placed Shkendija against the Scottish team, Aberdeen. Shkendija, with its newly arrived coach Shpëtim Duro, would play with dignity in the match against the Scottish team. Two renowned players, Ferhan Hasani and Besart Ibrahimi, would return and join the team, adding strength to it. The first match in Skopje ended with 1:1 draw, with Hristijan Kirovski’s goal. The return match in Scotland brought a very good performance of Shkendija, dominating the opponent’s field; unfortunately, there was scored no goal. The match ends at 0: 0, and with this tied score, Shkendija is eliminated due to the accepted goal in its own field. The beginning of this season finds the club more consolidated with several young players among whom Ferhan Hasani, who had left traces with his excellent performances several years ago in Shkendija. Changes also took place in the technical staff and club management. Ibrahim Ramadani is appointed in the post of the general director for the sports department, while the president of the club is appointed Professor Abdylmenaf Bexheti. All the changes that came in this season brought a new spirit and stability, and were very promising for Shkendija to target the championship title in the First League of the country as well as the Macedonian Cup trophy. The fall part of championship for Shkendija was going well but in some of the last matches, the performance level dropped and this situation was caused a new head coach, Bruno Akrapoviq, to arrive in Shkendija. The new head coach started off with the management of Shkendija, leading the winter preparations that took place in Ohrid and Antalya. On the 27th and 28th December 2015, the next edition of the world’s best prizes, the ‘Globe Soccer Awards 2015’ took place. This year, this important event of the world football is held in Dubai, where FC Shkendija and its representatives participate for the first time. Like every year, this year as well awards were given to the best of soccer, the best player of the year, the best sports agent, club, coach, referee, etc. The main motive for Shkëndija’s participation in this grand event was the selection of the Tetovo agent, Fali Ramadani, among the top five agents in the world. With Shkendija’s presence at the ceremony, Shkëndija’s sports manager Ibrahim Ramadani and Faton Zylbehari from the PR office were pleased to bring the club next to the clubs like Barcelona, ​​Benfica, Juventus, Inter and so on. During the numerous meetings, where experiences with the representatives of the world’s most renowned clubs were exchanged, the shirt of Shkëndija was given as a gift from FC Shkëndija to the Barcelona president, Josep Maria Bartomeu. Also, red and black shirt were also given as gifts to the best agents of 2015, Jorge Mendes (known as the manager of Cristiano Ronaldo and Hose Murino), Turkish agent Amet Bullut as well as Fali Ramadani, who received this gift with much emotion as it came from the club of his native town, the club he had loved since its foundation and continues to support to this day. Although the club was organized better than ever, Shkendija started this championship without an available stadium due to the reconstruction work which had begun. Under these circumstances, Shkendija was forced to play home-matches outside Tetovo, in other available stadiums such as in Skopje, Kumanovo, Gostivar, Kicevo, Ohrid, etc. Works at the stadium, in the first phase, had started with the green field to continue with the lighting fixtures (projectors) as well as the tribunes with all the other environments, dressing rooms, showers, toilets and so on. According to the project, the green field where the works had started in spring should have been ready by mid-September 2015 so that matches of the host clubs could be held here. But apparently, the bureaucratic procedures and poor management of the caused a delay till next spring, thus having Shkendija roam around other cities of the country to play in matches it was supposed to host at home. The lack of the city stadium during this season has certainly affected Shkëndija, not only financially; it has also put the club in an unfavorable position in the face of its opponents. 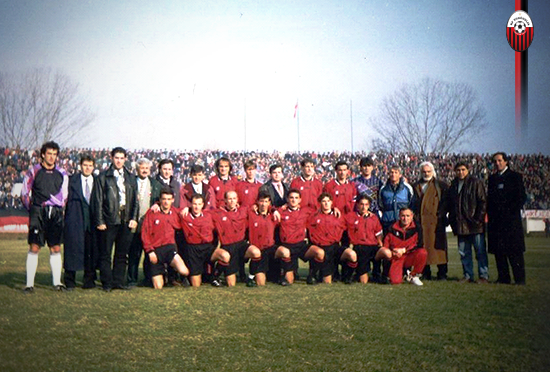 This history of FC “Shkendija” is written on the basis of data which was collected within a certain and limited time. So, this text is a developing matter rather than a definitive one, so anyone of you who can make a contribution with relevant information that you find important, please contact us to make this history as complete as possible.